Finding the right builder when you’re looking to make an amazing transformation of your space isn’t easy. The process can sometimes be a long and complex journey. You need someone that can lead you through the minutia and make that dream happen by helping you make the best decisions according to your wishes and your vision. You want a company built with a strong foundation, just like the one that marks the start of a new home. You’re looking for a builder that not only builds your dream home but one that values and builds a strong business by valuing relationships with people, employees, vendors and other trade professionals who support the community. Emergent Construction is that builder. Emergent Construction started in 2007 as a general construction and contracting company, appropriately named to suggest the top layer of a forest that pokes above the forest canopy, where only the tallest and strongest trees ever reach. Throughout their 10 years in business, Emergent has been part of a broad range of projects, including residential and commercial renovations to community revitalization projects. They do it all with one simple mission and philosophy. They partner with great people to do extraordinary things. Emergent’s extraordinary projects range from new residential homes and large-scale remodels to commercial projects. The company builds partnerships with clients starting by first building with their own employees. 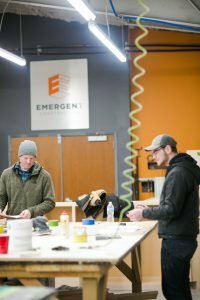 Emergent’s business model of employing craftsmen in-house creates an environment for employee development with a long-term focus on respect of an under-appreciated labor market. 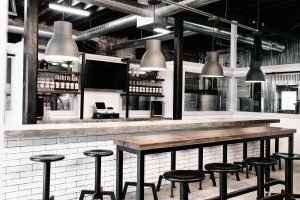 Proving their commitment to their employees, Emergent designed and built its new headquarters in the Kennedy/King neighborhood, putting all company operations under one roof. One important operation in the building is their custom cabinet workshop. Having all operations under one roof promotes a team environment, another of Emergent’s important practices and how they plan to facilitate their growth. “We understand that quality labor is only going to become scarcer, so having a plan for employee training and development from entry level to supervisory and management roles is vital to our sustainability,” Troyer says. Grooming and mentoring is something Matt Troyer is passionate about. He’s certainly succeeded, because the company has quadrupled its staff in the last five years. Building a team environment means something deeper for Troyer, though. The energy Emergent puts into building relationships with its employees is the same energy they give to their clients. The construction group has grown its client base by earning their trust, walking each customer step-by-step through the process to achieve the project goals. With a real estate background, Emergent works with clients to choose the best home to fit their budget. As a construction partner, they help the customer get the best return on their investment by identifying which upgrades to make on their home based on the length of time they expect to own the home. The no-nonsense approach prior to starting the project helps set the customer’s expectations and builds lasting relationships. One of Emergent’s customers is working on their third remodel with them. That type of customer loyalty speaks volumes considering the challenges a remodel can bring. Working through the nuts and bolts of a remodel with the customer is something Emergent handles with great care and communication. Troyer regularly posts on Instagram about projects in progress, making no attempt to hide even the most unpleasant aspects of any job. Emergent felt an immediate connection with a recent customer, West Fork Whiskey, and helped make their dream a reality. West Fork Whiskey is owned by locally-based partners whose mission it is to “pay respect to one of the best grain producing states in America and toast to hard work and dedication with every glass.” West Fork sought out Emergent because they have similar views in their respective dreams. Let Emergent help make your next idea a reality, whether that’s a new home, remodel or business. Call them at 317-572-7227 to find out how they can help or visit them online at emergent-group.com.